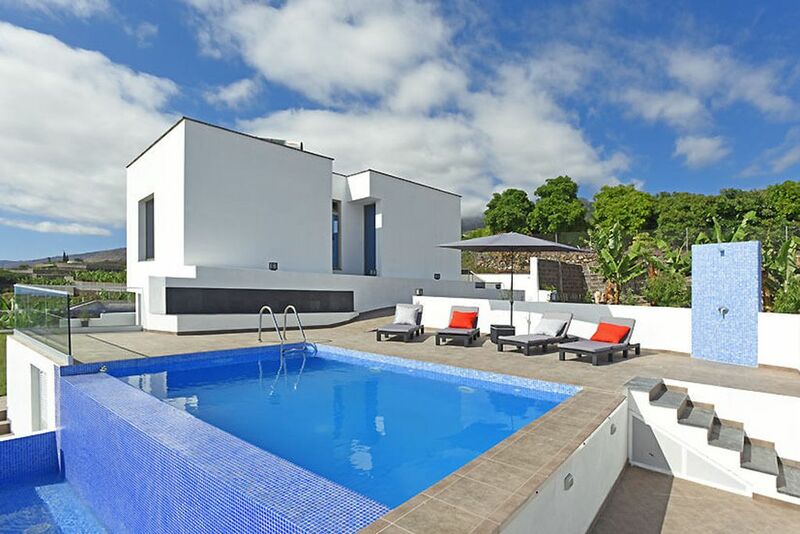 The beautiful modern house is located in a prime location on the sunny west side of La Palma. The house is located at an altitude of 350 meters above sea level in a rural area with views of the sea and the mountains. The beach of Tazacorte, as well as the city of Los Llanos with several shops can be reached quickly by car. On the upper floor there is a double bedroom, a bathroom with a whirlpool bathtub, a bedroom with two single beds, a room with a single bed, a sofa bed and a desk and a bathroom with a hydromassage shower. On the ground floor there are located the living room, the dining room, the modern kitchen and a bathroom. The kitchen is fully equipped with ceramic hob, fridge-freezer, oven, microwave, dishwasher, toaster and blender. For entertainment, guests also have satellite television and Internet (WiFi). The outdoor area is perfect for relaxing in the sun. The villa has a private pool with counter-current swimming system, solar heating and electric heating (15 euros / day), sun loungers and a barbecue area. The perfect conditions for a good holiday in La Palma!